Mating with two bishops is a little more complicated but not to worry, it's not that hard. checkmate with two bishops The black king will try to stay as close as possible to the barrier made by the two bishops. This way it will have the opportunity to escape the barrier if one of the bishops checks it. 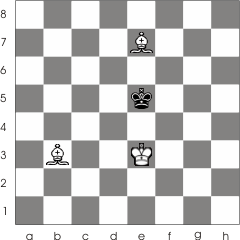 This is where the white king comes to the rescue, and helps the two bishops to reduce the Black's free space. 1. Kg2-f3 Kd4-e5 2. 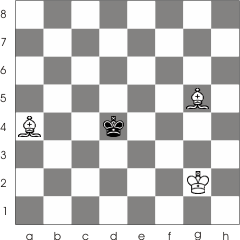 Kf3-e3 Ke5-d5 3. Ba4-b3+ Kd5-e5 4. 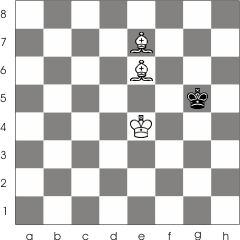 Bg5-e7 Now the black king can only go to the right. 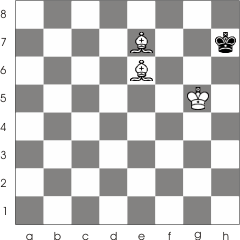 This were just a few simple checkmating patterns that may occur in endgames. 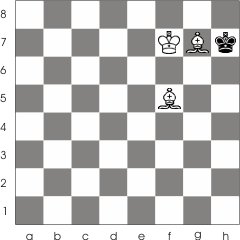 Now we are going to take a look at checkmating patterns that may occur somewhere else than the end game. This are quite often among beginners so by knowing them you will learn how to avoid them or how to apply them in your game.